If you’ve ever attended a knitting retreat, participated in a knit-along, or just knit with a small group of friends, then you likely know the spiritual warmth the act of knitting brings. The camaraderie and commiseration that come from friendships formed through knitting are like no other. People who were complete strangers in the beginning forge deep and lasting friendships, often within just a few hours. Our lives become intertwined, interknit with one another’s. 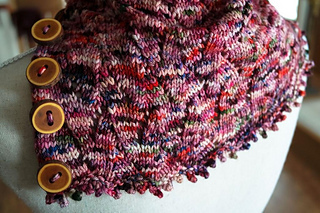 This interknitting of our lives was the inspiration for this cowl. The undulating pattern is like the conversations we have as we weave our lives together. 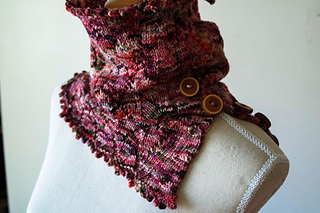 The close-fitting cowl reminds us of the warmth of friendship. Picot edges are reminiscent of the bubbles of laughter that so often errupt when knitters gather to share their projects and their stories. Worked from the bottom-up, Interknit begins with a picot cast-on. It is worked back and forth for several inches with buttonholes along one edge. The two ends are then overlapped to form a Henley-style placket and the cowl is completed in the round. A picot bind-off finishes the piece with a matching frilled edge. 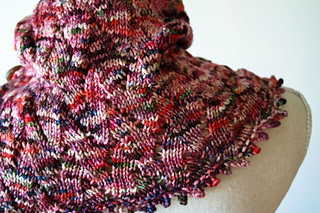 This stitch pattern can stand up to a strongly variegated yarn or a subdued tonal or solid. Whatever the yarn, I hope you are reminded of the friendships that are interknit with your own heart.